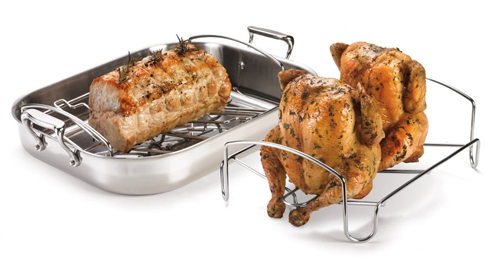 The Jet Grill is a rotisserie grill from the Czech Republic. The design is inspired by a jet turbine. Up on top is a propeller that spins from the heat. Attached to the prop via a spit is your food. Rising heat spins the propeller and turn your food. Mmm, jet fuel never tasted so good. It doesn’t look like it’s available quite yet in the US, so you might have to hop on a real plane to go pick one up. Or, if you Czech is up to snuff you can contact Jet Grill directly right here. Grilling isn’t just for chicken and hamburgers anymore. 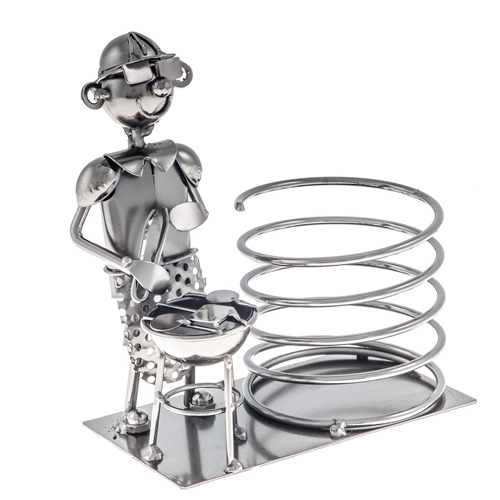 Nowadays, there are plenty of grill accessories to help grillers take their cooking to the next level. Sometimes literally. 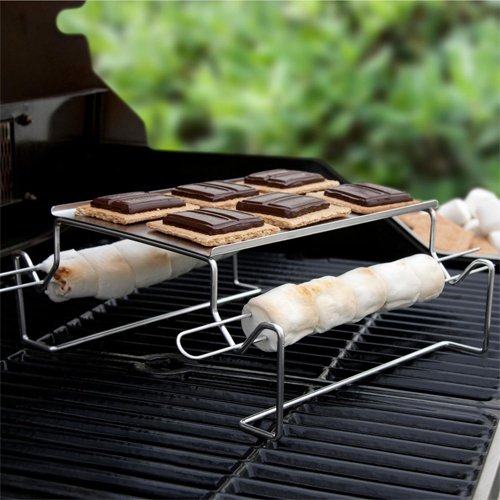 The Charcoal Companion Smores Roasting Rack is an all-in-one s’more helper that toasts marshmallows, warms graham crackers and melts chocolate. The skewers hold the marshmallows in place while the warming platform takes care of the gooey chocolate. Considering that grilling burgers, steak, chicken and fish is still the first thing that people think to cook when firing up the grill, chances are, s’mores can take a back seat while the entrees cook. Since fishmallows, chickocolate and burger crackers are rarely on the menu, raising the cooking surface for the sweets seems like a fine idea. Seattle fans! Your team just won the Super Bowl and you get to celebrate. The game sucked, the commercials sucked, but for the Pacific Northwest everything came up rosy. Especially because you now get to enjoy the off-season eating something else besides grilled Bronco. But judging from last night’s football game, you guys like the taste of grilled Broncos! 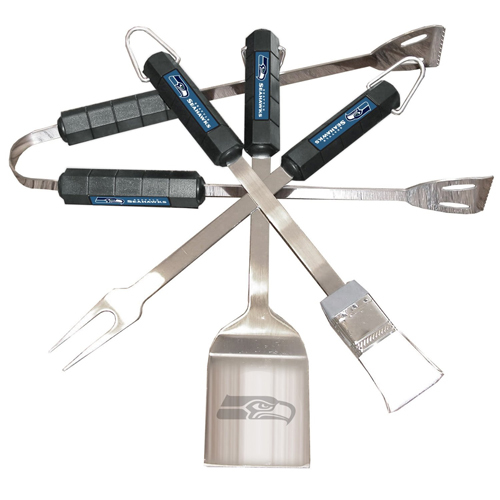 In any event, here’s a NFL Seattle Seahawks 4-Piece Barbecue Set to get you started. (Assuming of course, last year’s set is all rusty from being left out in the rain.) Enjoy! Whether you say coozie or koozie, coosie or kozy, one thing matters most and that is if it keeps your beer cozy and kold, err, cold. Oh, and that it comes in a BBQ apron. 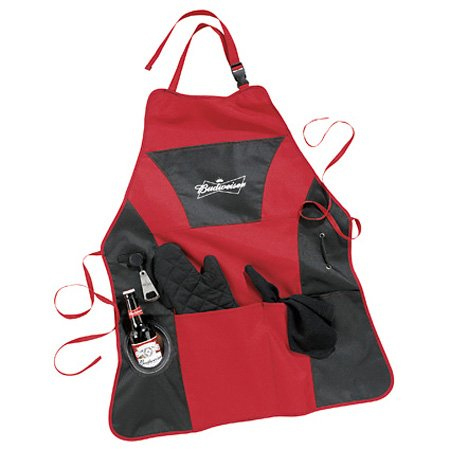 The Budweiser “Grill Master” Apron Kit covers all the bases, from the “insulated storage pocket,” to the included grill accessories, which include a bottle opener, padded oven mitt and towel. All that’s left to do is fire up the grill. Claim your rightful title of grill master with this well-equipped apron kit! Apron features the classic Budweiser bowtie logo screen printed across the center chest and comes with a detachable bottle opener, padded oven mitt and towel. It even has an insulated storage pocket to keep your Bud frosty cold while you’re standing next to that hot grill. One-size apron measures 24″ x 32″.